This document (download available from the right-hand column of this page) summarizes the conclusions of an exchange and collective reflection between rural development professionals linked to the Swiss Agency for Development and Cooperation (SDC) in Latin America and the Caribbean in July 2015. These professionals, who working in different subject areas, such as access to water, agriculture, rural income, natural resources, climate change and disaster risk, came together to identify good practices and strengthen the interrelationships that link these issues, based on specific projects in a concrete setting: the Estelí area in Nicaragua. This publication seeks to present the current state of art based on this analysis and provide recommendations based on this learning process. Modalities for the management and transfer of climate risk and adaptation to climate change at multiple scales. Financing and incentive schemes for integrated natural resources management. Water governance from a local perspective. The recommendations (key messages) arising from this learning process are outlined below. Details and an executive summary of the MultiNetwork meeting is available to download from the right-hand column of this page. The full meeting report, and a version in Spanish, can be downloaded from further resources. 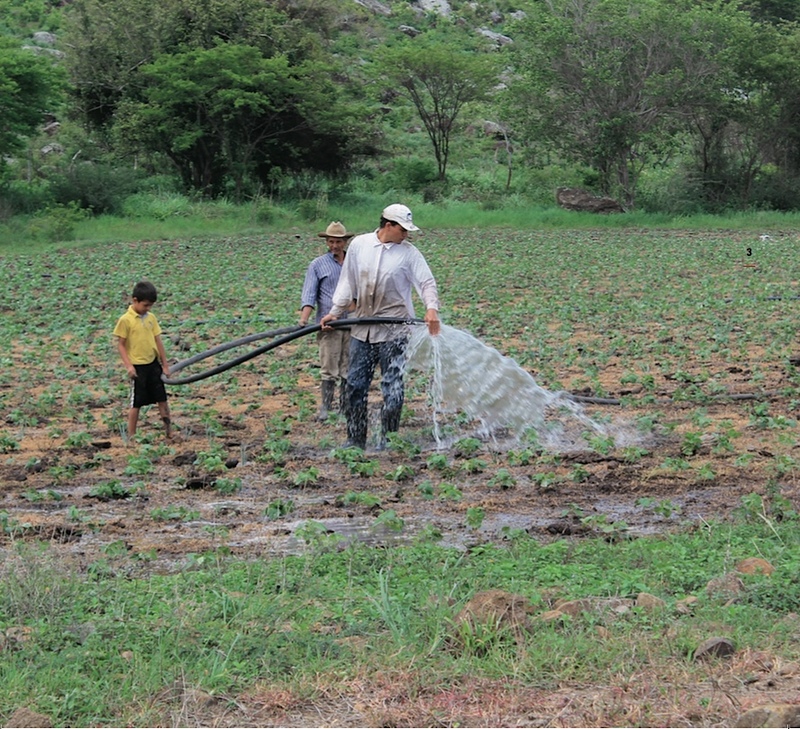 A series of good practices for land and water management at different scales exist and have proven their effectiveness in the sustainable and climate-smart development of watersheds, often with multiple benefits in terms of environmental protection, water resource enhancement, food security, protection from natural hazards or income generation. Projects should promote these practices that contribute simultaneously to various sustainable development goals (win-win opportunities or synergies) in different sectors and for different groups. The water, energy and food security nexus approach can help achieve this. Sustainable and climate-smart development interventions at the watershed level require a multi-disciplinary approach: from agriculture, forestry, water resources, environmental science, and civil enginee- ring to political science and economics. They should be designed and implemented following an integrated approach that takes into account the interrelations between different sectors and the possi- ble impacts (both positive and negative) beyond their specific field of work. However, SDC country strategies do not necessarily foster an integrated approach. A process to bring these thematic domains together is needed. Watershed approaches must be inclusive, taking into account all stakeholders. Natural resource projects should not only focus on small-scale, resource poor producers but seek ways to include the private sector and those with more resources. Such actors not only allow for a broader geographical and social coverage; they can also be local catalysers for change (e.g. showcase farmers). However, differentiated strategies should be designed especially for financing and providing incentives for sustainable land and water use practices, taking into account specific needs and capabilities. Projects with a watershed approach have to take into account the interests of all groups involved, both public and private. This calls for solid negotiations between all actors, through platforms for articulation where each actor is given a voice. Local governments should be able to play a leading role in those platforms. Platforms are also an opportunity for developing innovative financing mechanisms. In addition to the traditional financing sources (taxes, tariffs and transfers), financing can also come from compensation schemes provided by the private sector, as well as from crossed subsidies and public investments, especially in water infrastructure and management. Embracing a watershed approach when planning and implementing WASH systems (water supply, sanitation and hygiene) allows for a more comprehensive perspective, including issues such as protection of water sources, discharge of wastewater, and the interrelation with other water uses such as water for agriculture, energy, industry and ecosystems. Projects that pursue both environmental and agricultural productivity goals should consider a market and value-chain based approach early on, from their inception. On the other hand, market-driven interventions should not forget to make a sound analysis of the environment and watershed in order to avoid, for instance, the risk of promoting a water-demanding agriculture value-chain in the context of limited water resources. When rural families apply practices that make water availability, agricultural production and income more secure in the face of climate risks, they do not “just” reduce climate risks, but they also generate a set of ecological, social and economic benefits. Disaster risk reduction, climate change adaptation and environmental protection practices will make development outcomes more sustainable. If microinsurance is promoted as a risk transfer mechanism, it needs to be integrated and closely linked to other (existing and improved) risk management practices of the agricultural producer. Risk transfer is additional to risk prevention, mitigation, response and recovery from losses. Experience suggests that substantial (public) subsidies are necessary for such schemes, at least in the early phases. A better, deeper and more detailed knowledge base about environmental, social and economic conditions and their interrelations is still needed in most cases, both for the design of development interventions as well as for the monitoring of impacts. Research and technical expertise are required for this purpose. Existing local empirical knowledge must be considered and valued. Training methods such as learning from fellow farmers and applied research have proven valuable at the beneficiary level. Data collection at water catchment work, Moyobamba, Peru (from p. 7 of the summary report).